If you've been reading here for a while, you might have noticed that one of the things I try hard to do with my kids meals is to provide variety, and to continually expose them to different foods, or at least to different ways of serving the same foods. You may have also heard me talk about how much I believe in "everything in moderation". We don't follow any specific kind of "diet", other than eating just real food. (I don't consider that a diet though, I consider that to just be normal.) We don't have any food allergies or specific food intolerances, there isn't anything that we can't eat. We are omnivores, who eat all real foods, in moderation. But moderation to me means that we don't eat all the things all the time, and we shouldn't eat all the kinds of things at every meal. So even though I don't have to for a dietary reason, you will still find me fixing meals for my family that are gluten free, grain free, nut free, dairy free, meat free, etc. I believe in doing this to provide variety for my kids, and I think it's good for them to learn that they can have a great meal even if it doesn't include bread, or dairy, or meat, etc. I think that sometimes limiting things from our meals also provides a great learning opportunity for the kids - we have had conversations about what is gluten, what it means to be gluten free, or nut free, what it means if someone has a food allergy. Even though we don't have any food allergies I still want my kids to understand and be aware of what that means, so that they can be understanding and supportive of their friends and classmates who do have food allergies, and understanding of why they maybe can't take certain things to school. Hats off to the moms who are getting extra creative in making those well rounded meals for their kids with food allergies or intolerances every single day. My occasional lunches are just a drop in the bucket compared to what some folks do, but hopefully they can give you some good ideas. All of my lunches are packed in Easy Lunchboxes. I'll write a whole post about how much I love them one of these days. But in the mean time, click the link to the right to order some for yourself. These are our favorite set - the "brights" colors, but they come in other colors too. Now, here you go. 28 Gluten free (and mostly grain free) lunches! Note that where I have used chips or tortillas in these, they are gluten free corn chips and tortillas, unless otherwise noted. Quesadillas on gluten free corn tortillas, tomatoes, sour cream, strawberries. Two have a boiled egg, one has almonds, one has yogurt covered raisins. 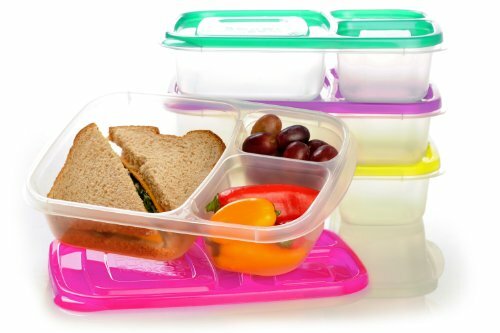 Packed in EasyLunchboxes, with silicon muffin cups and these dip cups. A simple chicken salad, with just roasted chicken, mayo, seasoned salt, on top of lettuce, with cucumbers and tomatoes. One the side there is raw fermented sauerkraut, and some seaweed. (this is my lunch, not a kids lunch). Taco salad made from dinner leftovers: lettuce, shredded beef, black beans, cheddar cheese, jack cheese, tomatoes. On the side there is one container of sour cream + salsa, and one of guacamole, to be mixed in to the salad for dressing. Bunless burger sticks: bites of homemade hamburger patty, cheese, tomatoes on skewers. Grapes and yogurt covered raisins on the side. Two have avocado, one has dried mango, one has yogurt, one has cottage cheese. Oops, I slipped some regular cookies in these one, but I wanted to share it anyway. Just swap out the cookies with a gluten free cookie of your choice, or add another fruit or a bit more cheese to that spot. Tomatoes and cheese on skewers, salami (I checked the label, it was gluten free), babybel cheese, strawberries, raspberries, grapes, and blueberries. Grain free quesadilla rolls - these are coconut flour based grain free wraps/tortillas. Two have ham and cheese, one has just cheese, one has sunbutter and jam. With apples, strawberries, cucumbers, and carrots. Mini cheese kebabs, salami, tomatoes, cucumbers, berries, and dried fruit. Mini sandwich skewers. Grain free blender bread from Against All Grain, one has mayo, ham and cheese, the other has butter and cheese, with strawberries, blueberries, and apples on the side. The two on the left here are grain free: refried beans, carrots, cheese, pear, and banana. The two on the right could be gluten free if you used fish that wasn't breaded and made sure to buy tortillas that were just corn: fish tacos with shredded cheese and cabbage, carrots, oranges, cheese. Skewers of ham, cheese, tomato, with carrot, celery and zucchini in between. On the side there are grapes, orange bites, and banana. Egg salad, pepperoni, tomatoes, apricots, cheese. Corn tortilla cups with shredded cheese and black beans, cheese, apples, sour cream on the side, and one has a few slices of salami. Desconstructed nachos: corn tortilla chips, black beans, chicken, sour cream, shredded cheese, cucumbers, tomatoes. Homemade meatballs with sausage, mushrooms, and kale; pickles, egg, almonds & raisins. Ignore the cookie and this lunch is grain free. Skewers of hot dog, cheese, tomato, cucumber, with carrots and peppers on the side. Apples, oranges, bananas. Two have boiled egg, one has sunbutter. Nacho kids: corn tortilla chips, cheese, black beans, ground beef taco meat, sour cream, veggies and orange. Tarragon chicken salad, cucumbers, guacamole, pears, rice crackers. Kale salad dressed with sesame oil and tamari soy sauce, leftover salmon, tomatoes. Cheese and melon. The one on the top middle is grain free: curry chicken salad, tomatoes, avocado, peppers, cucumber, pears. The others have bread and cookies, but this could be made gluten free with gluten free bread and cookies. The following lunches do contain some small amount of cracker or bread, but they could easily be adapted to be gluten free. In most cases I would just swap out the crackers for a gluten free cracker of your choice. Or leave it out all together and put a little extra fruit or protein in its place. The cornbread recipe that I use in these corn dog muffins works really great with gluten free flour. My mom and sister both make it that way all the time. So make a batch of corn dog muffins for the freezer, and then just use a gluten free cookie in place of the regular ones I've got here. Meatballs on skewers with ketchup for dipping, peas, cheese, apples. Put a slice of gluten free bread underneath, or leave it out. It was mostly here just to keep everything in place. Chicken salad, cucumbers, tomatoes, orange and kiwi. Two have avocado, two have cheese. Serve with gluten free crackers. Two of these have cheese, ham, hummus, carrots, tomato and banana. One has the same but cucumbers instead of ham. The fourth has the same as that but swapped out sunbutter for the hummus. Serve with gluten free crackers.